India is suffering from a massive attack of the etail fever. Every month a new player enters the market and that leaves a plethora of confusing not-so-alternatives to the buyer. In any industry, there are leaders and followers. The leaders eventually end up becoming the niche players that decide the entire fate of the industry and not just their own destiny. What drives them? It is that unquenchable thirst for innovation and the consistent delivery of services to the customer that keeps them going. Flipkart.com is India’s Amazon. 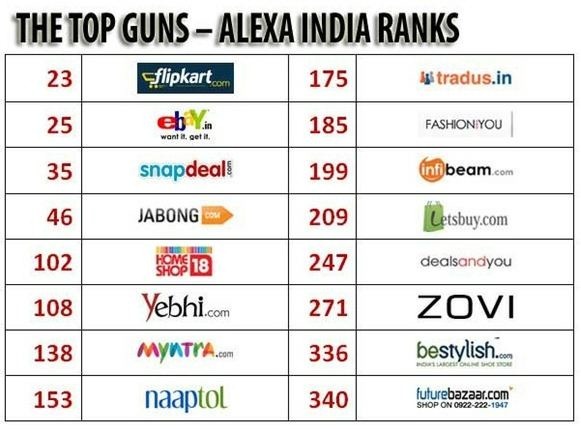 Amazon wouldn’t have even imagined that an indigenous player would be such big competition to it and its entry into the Indian market in partnership with junglee.com has not even managed to secure enough news space. Not even 40% of the online community was aware of the entry of Amazon and its just struggling among the many other online retail players. 1.1 What is required for being successful in the online retail business? In one way, Zovi.com, Myntra.com and Bestylish.com have adopted a rather safe strategy of getting specific about the products they deal with. What is required for being successful in the online retail business? Apple’s core motto is create a new user experience in terms of design. Britannia wants people to eat healthy and think better. Amazon online has the core aim of having everything from A to Z available online. A clearly defined purpose of existence helps a long way in helping one not getting lost. It defines the goal of the company and particularly helps in a traversing a meticulous path to carve a niche for oneself like the above mentioned examples. Flipkart.com has evolved to be one of the most trusted brands because of their prompt before-the-deadline delivery. They are the masters of under-promising and over-delivering. Having seamless, organized delivery channels is a very critical factor. We don’t live in a perfect World and when it comes to appliances, gadgets and apparel, the room for error is just a lot. A customer, especially an Indian customer, that examines a product umpteen times before paying for it, would love to take the vendor to task if the product is defective in the etail model. Ensuring a proper relationship building channel can solve this to a great extent. When the product is defective, showing empathy, reassuring the customer of prompt and free replacement is extremely important. Worst of all, never give irresponsible answers like ‘We procured it from someone and its’ their fault’. With Social media sites like twitter, Facebook etc. Getting a brand image damaged is so easy with such answers. One of the main reasons for online retail to pick up in India is the attractive discounts that come with it. The reasons are obvious as there are no overheads like showroom rent, employee salary etc. A Landmark or an Odyssey can never imagine selling books at such slashed prices considering the overheads they face in terms of things mentioned above. There is a margin which the retailer needs to maintain to make profits. But, this needs careful and analytical working out. Hiring specialists in e-commerce could help a great way in working out mutually beneficial discounts. Like the good old saying ‘Make hay while the sun shines’ goes, this business is booming in India and the recipe to success is not that difficult provided the recipe is correctly followed. Tata DOCOMO launches Twitter App “TwittCom” for VAS! Facebook launches promoted posts – A Marketers dream! Not to mention the CoD option ensures that the customer places an order without transferring any cash. I wonder how FK or any of the retailer handles CoD rejects … as cancelled orders (which would increase their top line), or as discarded shopping carts.